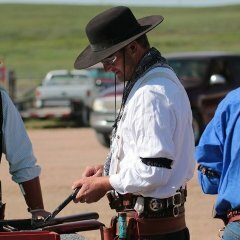 Come one, come all and join us for the shootout at Pawnee Station, July 5 thu 7, 2019 in Nunn, Colorado! Info and entry forms can be found on the Pawnee Station website! If you have any questions, let me know, if I don't know the answer, I'll find out fer ya! Sure hoping to make it in 2019! Going to print out the entry and put it in the folder for next year. You'll have a good time at Pawnee Station - & if there's a way to swing it, stop in at Briggsdale County Shootists just a little south east of there on your way home the following weekend. It can only do ya some good my friend. Best wishes & straight shootin ! Stirrup - You'd best be there, I'd hate to have to lead a posse up to Nebrasky to git you and drag you back at the end of a rope! A great match at a fantastic range. I'm so glad I stopped in this year. Thanks to Red River Wrangler and Sweet Lil for the arm twistin'. Was there last year, was a great match, is on our list this year also. Grizzly I have a good rope that will take of ST, let me know if you need it. Take care my friends. Glad to hear you guys are comin back to Pawnee in 2019. Lookin forward to another good time. I'm signed up for the Siege at Clarks Station. See all you cowboys there in May. The snow is falling today in the Colorado Territory, but rest assured, spring and summer will come. And July will be here before you know it! Get those entries in now and firm up your plans before you forget! Gonna be a hoot and at least three hollars, sure hope to see you there! As always, if you have any questions, please ask me, if I don't know the answer, I'll find out for ya! Is it time to shoot yet? The hard working cowgirls and cowboys at Pawnee Station are already at work to make sure everyone has a good time, sure hope that you can join us! We sure are looking forward to hosting you at the Shootout for Pawnee Station! yeehaw, it's gonna be FUN!